Police: Mom shoots baby, then herself in Sarasota murder-suicide. In September 2013 a devastating and very sad story aired on the Orlando news. The city of Sarasota needlessly lost a mother and baby. This story impacts us greatly at Life Counseling Solutions as we work with women who have suffered from Postpartum Anxiety and Depression. In Florida May 2013, a mom left her baby in the car and the baby died. She was suffering from Postpartum Depression. We can’t help but wonder if we could make a difference! Could we have prevented a tragedy like this from happening? Was the Sarasota Murder-Suicide, Postpartum Depression? If others knew how to find help for a mom and baby could we prevent this from happening? How can you tell if a mom is suffering or is at risk for postpartum depression? First, you should know a mom may not be able to ask for help. Why not? Media reports of severe postpartum issues create shock waves in the public. The loss of a mother and child is painful and hard to understand. It hurts deeply. Thus, shame becomes associated with postpartum depression. Many women who suffer during the postpartum period do not seek treatment for fear of being identified with those who take the lives of their children. Cases of infanticide coupled with suicide make the news headlines however; it is very rare for postpartum depression and anxiety to develop into postpartum psychosis as in the cases above. It is important to know this can be prevented and postpartum psychosis can be treated successfully: early intervention and education is the key to saving lives. You can make a difference! Here’s what YOU NEED TO KNOW. Sometimes a mom may or may not look typically depressed. She may even appear that she has it all together and not someone you would think is suffering. But in this case someone did notice. Cheryl Glassford reported the neighbors said they weren’t very close to the family however one woman who lives right next door said Harnish didn’t appear happy in recent days. A mom may reveal certain symptoms or signs of postpartum depression or anxiety which can be experienced up to a year after the babe is born. If untreated, a women can suffer for several years, symptoms can become worse, even severe. Untreated postpartum can have a huge emotional impact on the mom, her baby and the health of the family. 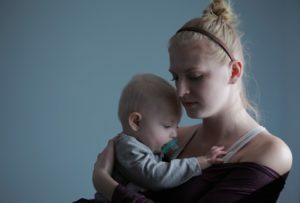 Knowing the signs of postpartum depression may prevent the unnecessary suffering of a new mother, baby and allow those around her to identify the issue and advocate for help. 10 Things You Should Know About A Mother Who Might Need Help. 1. She may feel anxious or panicky. 2. She has physical problems such as chest pain, racing heart, shortness of breath, dizziness, numbness in hands or feet, tingling sensations, nausea or upset tummy. 3. She has upsetting thoughts that she can’t get out of her mind. 4. She feels as if she is going crazy. 5. She feels sad or depressed. 6. She has problems eating or sleeping. 7. She feels like she should have never became a mother. 8. She is feeling more irritable or angry. 9. Feeling like she can’t cope with it all. 10. Worried she might hurt her baby or herself. There is help and no woman has to suffer alone. Women can and do recover. Postpartum depression recovery rates are high and treatment outcomes are successful. Be an advocate for a mom and learn more about Postpartum Depression and educate those around you about the signs, symptoms, and myths. If a mom is struggling with her emotions and needs immediate help, call (911) or take her to the nearest emergency room. Let her know you are willing to walk with her through this by being supportive and not judgmental. Help talk to her doctor, find a counselor/therapist, and remind her she is not alone. 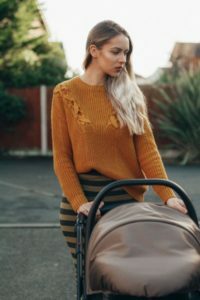 By bringing awareness, education and support to the feelings of postpartum depression and anxiety, it will enhance and potentially save the lives of many moms that are struggling, as well as, their baby’s. If you or someone you know has been struggling with depression, suicidal thoughts and needs help…. call the Suicide Prevention Lifeline at 1-800-273-8255. Where Can I Get More Information or Counseling in Orlando? Postpartum Society of Florida/ Facebook and site. Postpartum Support International/ Warm Line and Phone support for moms. Take the postpartum anxiety depression questionnaire.